Niranjan Joshi, 35, an employee of Pune-based knowledge process outsourcing company intends to create a large corpus for his retirement using equity funds. Though he appears to be confident about his bright future, it was not the case earlier. A conservative young mind to begin with, he started saving in fixed deposit when he started working a decade ago. But the low returns on fixed deposits and other fixed income options made him realise that he has to take some risk if he wants high returns. In 2014, he tried his hand at midcaps, but realised that it is far too risky area and instead chose to invest through mutual funds. What started as an investment in equity linked saving schemes – has now evolved into SIP into four equity mutual fund schemes comprising ELSS, large and mid-cap funds. Though he is regular with his investments, he is clear that only that money which he won’t need in near term will be invested into these funds given the risky nature of these investments. The conservative investor inside him tells him to steer clear of high-risk sectoral funds and expects around 10-11% returns from his investments in diversified equity funds. Joshi came upon mutual funds through an arduous road to wealth creation whereupon he did not create much wealth initially. But his early experience taught him valuable lessons. For many, investing in equity funds remains tricky — especially when you have seen stocks losing money in the past and do not have the risk appetite. The fear of inflation makes some conservative investors think of investing in stocks. Some conservative investors look at stocks because they fear of ‘being left out’ when majority of the investors are queuing up to pile up equity mutual funds. Financial planners advocate investing in stocks or equity mutual funds to beat inflation and build a corpus that will cater to one’s future needs, even if one is a conservative investor. “If you are working and planning for your retirement, do invest in equity funds given the long time-frame in your hand. It will help you beat inflation, create a large enough corpus with relatively less contribution, over a portfolio comprising of bonds only. 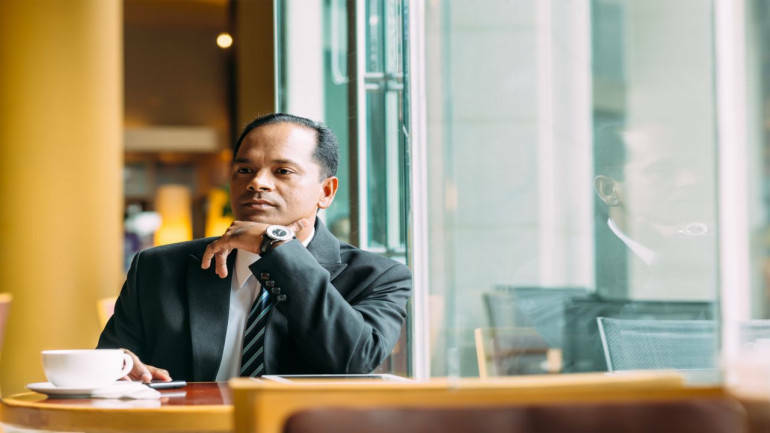 Even a retired individual should have some exposure to equity funds, as he has to live at least 20-25 years of retired life,” says Suresh Sadagopan, founder of Ladder 7 Financial Advisories. If you are just retired, your retirement corpus should last for at least two decades. If you opt to keep all your money in fixed income instruments, you run the risk of using it up much earlier than you expected, given rising inflation. Financial goals do not come to an end with your retirement. There are many individuals who want to travel across the globe after they retire. Some want to leave a legacy for their grand-children and some want to donate for social causes. “Depending on the financial goals, either the size of corpus required increases or the time on hand increases. In both the cases, it makes a lot of sense to invest in equity mutual funds, even after retirement,” says Joydeep Sen, founder of wiseinvestor.in. If you have bought into the idea of investing in stocks, you may want to do it yourself or give the task to a professional. Very few individuals have the skill set and the time to pick the right stocks. Hence, one can opt for the mutual fund route to invest in stocks. Large cap funds and index funds are good starting point for a conservative investor. “Investing in large cap funds and index funds helps conservative investors to begin with as they are familiar with the names and brands,” says Vishal Dhawan, founder and managing director of Mumbai based Plan Ahead Wealth Advisors. Large cap funds and index funds invest in large sized companies and are less volatile investment option compared to the mutual fund schemes focussed on stocks of mid and small sized companies. In the past one year small cap focussed funds and mid cap focussed funds lost 20.37% and 14.06% on an average. The large cap focused funds however lost only 1.39%. Though large cap funds lost less than the mid and small cap funds, many of them failed to beat Nifty. Nifty delivered 0.26% returns over past one year. Going forward, largecap funds may find it difficult to beat the benchmark index for reasons such as restricted stock universe of 100 stocks and total return indices being made the benchmark. That may make you consider a shift to index funds. Index funds offer to mimic the underlying index. The expense ratio of these funds are less than large cap funds and hence can be a better alternative for investors. ETFs offer a low-cost option to invest in equities, but lack of liquidity on stock exchanges is a hindrance. Besides, you also need a demat account to buy and sell them. Though most financial planners recommend investing in largecap funds for conservative investor, there are financial planners who think otherwise. Suresh Sadagopan advocates investing in large cap, index funds and aggressive hybrid funds for conservative investors. Joydeep Sen, founder of wiseinvestor.in also recommends investing in a mix of large funds and multi-cap funds. The mix should depend on the risk-taking appetite of the investor, he says. If the individual wants to keep the volatility to minimum, she should stick to large cap funds. Though equity funds have rewarded investors with handsome returns in long term, will it help you to achieve your long term goals – such as retirement? Let’s understand this with an example. Though these numbers make a case for investing in stocks, many first time conservative individual investors find it difficult to ascertain the amount of money they should be investing in stocks. “It is better to start with at least 10% of your money,” says Kiran Telang. You may choose to raise your allocation later if you find that you can stomach the volatility associated with equity funds. Whatever amount of money you intend to invest, enter the equity funds in a systematic manner and for at seven to 10 years horizon. 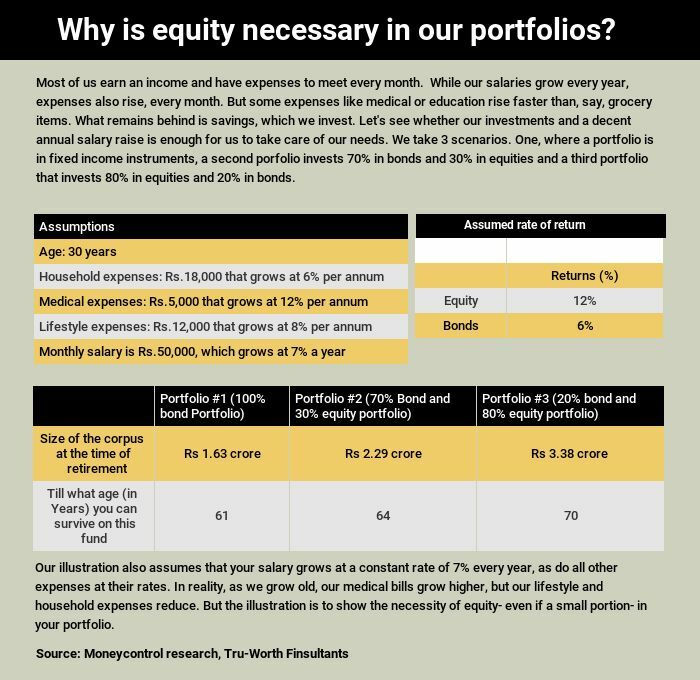 “Many times individuals allocate very small amount of money (1% to 2% of their investible funds) in equity funds with one to three years horizon. They want to taste the waters. But it neither gives you the returns that would materially impact your overall portfolio, not it gives you the true taste of equities. Never ever do this. Whatever money you want to invest, let it remain invested for at least seven to ten years,” says Vishal Dhawan. If you are salaried or have regular income then you should be investing through systematic investment plan. If you do not have regular income, invest your money in liquid funds and then opt for a systematic transfer plan to transfer money at regular interval into equity fund of your choice. Do review your allocation to equity and rebalance every year, if required.